The public views America’s role in the world with considerable apprehension and concern. In fact, most Americans say it would be better if the U.S. just dealt with its own problems and let other countries deal with their own problems as best they can. With the United States facing an array of global threats, public support for increased defense spending has climbed to its highest level since a month after the 9/11 terrorist attacks, when 50% favored more defense spending. Currently, 35% say the U.S. should increase spending on national defense, 24% say it should be cut back and 40% say it should be kept about the same as today. 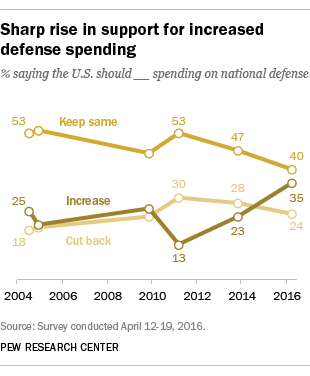 The share favoring more defense spending has increased 12 percentage points (from 23%) since 2013. Most of the increase has come among Republicans. Fully 61% of Republicans favor higher defense spending, up 24 percentage points from 2013. 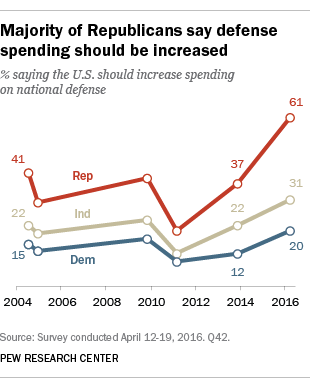 Support for more defense spending has increased much more modestly among other partisan groups. And the gap in support for higher military spending between Republicans and Democrats, which was 25 percentage points three years ago, now stands at 41 points. This shift underscores the deep partisan and ideological divisions in attitudes about U.S. foreign policy – differences that extend to how to deal with terrorism, the nature of global threats, views of the Israeli-Palestinian conflict and how deeply involved the United States should be in the world. Amid a presidential campaign that has highlighted conflicting visions about America’s global role, many of these differences are reflected in the attitudes of the candidates’ supporters in the primary campaigns. Note: This survey was conducted before Ted Cruz and John Kasich suspended their presidential campaigns earlier this week. Among GOP voters, majorities of Donald Trump (66%) and Ted Cruz (64%) supporters want to boost U.S. defense spending, compared with 52% of John Kasich supporters. Among Democratic voters, Bernie Sanders supporters are far more likely than those who support Hillary Clinton to favor cutting back U.S. defense spending (43% vs. 25%). These are among the main findings of America’s Place in the World, a survey of foreign policy attitudes conducted periodically by Pew Research Center. In June, Pew Research Center will also publish a report exploring European public opinion on key foreign policy issues, including perceptions of major international threats and views about international engagement. The report will compare European and American views on many of these topics. The new survey, conducted April 12 to 19 among 2,008 U.S. adults, finds the public remains wary of global involvement, although on some measures, support for U.S. internationalism has increased modestly from the historically low levels found in the 2013 study. Still, 57% of Americans want the U.S. to deal with its own problems, while letting other countries get along as best they can. Just 37% say the U.S. should help other countries deal with their problems. And more Americans say the U.S. does too much (41%), rather than too little (27%), to solve world problems, with 28% saying it is doing about the right amount. The public’s wariness toward global engagement extends to U.S. participation in the global economy. Nearly half of Americans (49%) say U.S. involvement in the global economy is a bad thing because it lowers wages and costs jobs; fewer (44%) see this as a good thing because it provides the U.S. with new markets and opportunities for growth. On each of these measures, Republicans express greater skepticism about U.S. international engagement than do Democrats. Roughly six-in-ten Republicans (62%) say the United States should deal with its own problems and let other countries deal with their problems as best they can, compared with 47% of Democrats. And 55% of Republicans view global economic engagement negatively, compared with 44% of Democrats. Trump’s primary campaign supporters stand out for their negative assessments of U.S. involvement in the global economy. Fully 65% of Republican registered voters who prefer Trump for the Republican presidential nomination say U.S. involvement in the global economy is a bad thing, compared with only about half of those who prefer Cruz (49%) or Kasich (46%). Differences among Democratic voters are less pronounced, but Clinton supporters view U.S. global engagement positively, 55% to 37%, while Sanders supporters are divided (47% good, 48% bad). The skepticism of Trump supporters toward U.S. global economic ties extends to increasing the level of imports from developing countries. Among Trump backers, just 32% support importing more goods from developing countries, while 67% are opposed. By comparison, 52% of those who prefer Kasich and Cruz, along with majorities of backers of both Democratic candidates, support an increase in imports from these nations. While Americans remain skeptical of U.S. international involvement, many also view the United States as a less powerful and important world leader than it was a decade ago. Nearly half (46%) say the United States is a less powerful and important world leader than it was 10 years ago, while 21% say it is more powerful, and 31% say it is about as powerful as it was then. The share saying the U.S. has become less powerful has declined since 2013, from 53% to 46%, but is among the highest numbers expressing this view in the past four decades. These attitudes also are divided along partisan lines: Republicans (67%) remain more likely than independents (48%) or Democrats (26%) to say that the U.S. has become less powerful and important. However, although many Americans believe the U.S. has become less powerful than it was in the past, the predominant view among the public is that the United States is the world’s leading economic and military power. In a separate Pew Research Center survey conducted April 4 to 24 among 1,003 U.S. adults, a majority of Americans (54%) say the United States is the world’s leading economic power, with China a distant second at 34%. This is the first time, in surveys dating back to 2008, that more than half of the public has named the United States as the leading economic power. The gap between the United States and other nations in perceptions of military power is even greater: 72% say the U.S. is the leading military power, while 12% say it is China and 10% Russia. The share saying the U.S. is the top military power has grown from 64% in 2013. In the view of the public, the top global threat facing the United States is ISIS – a concern that was not on the radar when the prior America’s Place in the World study was conducted three years ago. Currently, 80% say the Islamic militant group in Iraq and Syria known as ISIS is a major threat to the well-being of the United States, while 72% view cyberattacks from other countries as a major threat and 67% say the same about global economic instability. Public attitudes about most global threats have held steady in recent years, including some, such as China’s emergence as a global power, that have received attention in the current presidential campaign. The share of Americans who say China’s emergence as a power is a major threat to the U.S., currently 50%, has not changed substantially in surveys dating back more than a decade. There are partisan differences over a number of global concerns, but the widest gap, by far, is over the threat to the United States from global climate change. Nearly eight-in-ten Democrats (77%) view global climate change as a major threat to the U.S., compared with just 26% of Republicans. Climate change ranks as the top global threat for Democrats, along with ISIS (76% say the group is a major threat). Among Republicans, climate change is the lowest of the eight threats included in the survey. Republicans and Democrats also differ sharply over the seriousness of the threat posed by large numbers of refugees leaving countries such as Iraq and Syria. Nearly three-quarters of Republicans (74%) view the refugee exodus as a major threat to the well-being of the United States, compared with just 40% of Democrats. For those who back Trump in the primary campaign, the large number of refugees leaving Iraq and Syria is especially worrisome. More than eight-in-ten GOP voters who support Trump (85%) say the refugees are a major threat to the U.S., compared with 74% of those who prefer Cruz and 59% who prefer Kasich. Among Trump supporters, only the threat from ISIS (93% major threat) ranks higher than refugees, among the eight issues included. Among Democratic voters, just 40% of Clinton supporters and 34% of Sanders supporters view the refugee migration as a major threat. On other international issues that have emerged in the 2016 campaign – including views of Israel and the Palestinians and policies to address the threat from ISIS – there also are differences between partisans and candidates’ supporters. As has been the case for nearly four decades, more Americans say they sympathize more with Israel (54%) than the Palestinians (19%). About one-in-ten (13%) volunteer that they side with neither Israel nor the Palestinians in their dispute, while 3% sympathize with both sides. Since July 2014, there has been a modest rise in the share of the public saying they sympathize more with the Palestinians, from 14% then to 19% today. Virtually all of this increase has come among Democrats, especially liberal Democrats. The number of liberal Democrats sympathizing more with the Palestinians has nearly doubled over the past two years, from 21% to 40%. The Democrats’ differences over Israel and the Palestinians are reflected in the way Sanders and Clinton supporters view the situation. Far more Clinton supporters sympathize with Israel (47%) than the Palestinians (27%). Sanders backers are statistically divided, with 39% sympathizing more with the Palestinians and 33% more with Israel. Overwhelming shares of GOP voters side with Israel, regardless of which candidate they support. 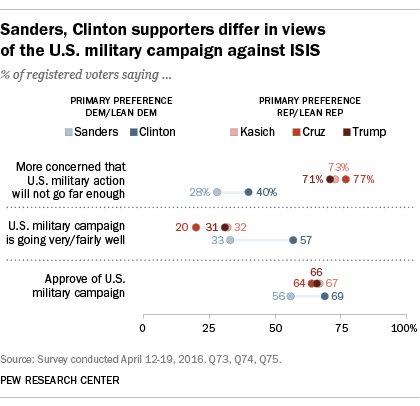 Public support for the U.S. military campaign against ISIS has changed little since 2014. Currently, 62% approve of the military campaign, while 33% disapprove. While there is broad and continuing support for the military campaign, there are sharp partisan differences over whether the greater concern is that the U.S. will go too far, or not far enough, in pursuing military action against ISIS. Most Republicans (74%) say their bigger concern is the U.S. will not go far enough in stopping Islamic militants in Iraq and Syria, while just 23% are more concerned that the U.S. will go too far in getting involved in the situation. Most Democrats (57%), by contrast, are more concerned that the U.S. will go too far militarily. Among Democratic voters, about two-thirds of Sanders supporters (68%) are more worried that the U.S. will go too far in Iraq and Syria, compared with about half (53%) of Clinton supporters. Most GOP voters, regardless of their preference in the primary contest, say their greater concern is that the U.S. will not go far enough in stopping ISIS. While Trump recently called into question the value of U.S. participation in NATO, Americans overwhelmingly view NATO membership as beneficial for the United States. About three-quarters of Americans (77%) say being a member of NATO is a good thing for the United States, while just 16% see this as a bad thing. Large majorities in both parties say NATO membership is good for the U.S. But 30% of those who prefer Trump in the GOP primary contest say being a member of NATO is a bad thing for the U.S., higher than among other GOP voters or supporters of the Democratic presidential candidates. GOP leads on terrorism, foreign policy. As has been the case for more than a decade, more people say the Republican Party can do a better job than the Democratic Party in dealing with the terrorist threat at home (46% vs. 37%). The Republicans also lead the Democrats on foreign policy (46% to 38%) and trade (48% to 37%), while the Democrats hold a sizable advantage on global climate change (51% to 30%). Little change in Obama job rating on foreign policy. Currently, 40% approve of the way Barack Obama is handling the nation’s foreign policy, while 53% disapprove. About four-in-ten (41%) think the Obama administration takes into account the interests of other nations too much, while 18% say it takes other nations’ interests into account too little; 36% say the administration gives about the right amount of attention to the interests of other countries. Little change in concerns over China, Russia. Only about a quarter of Americans (23%) view China as an “adversary” of the United States, while an identical percentage (23%) says the same about Russia. Pluralities describe both countries as serious problems but not adversaries (44% each). These opinions have changed little in recent years. Sanders supporters stand out for civil liberties concerns. Half of Americans say their bigger concern about government anti-terrorism policies is that they have not gone far enough to adequately protect the country; 35% are more concerned that they have gone too far in restricting civil liberties. Large majorities of Republican voters, regardless of their primary preference, say their bigger concern is that anti-terror policies have not gone far enough to protect the country. On the Democratic side, supporters of the two candidates differ in their views. Among Sanders supporters, 51% say their bigger concern is that U.S. policies have gone too far in restricting civil liberties, while 33% say they have not gone far enough in protecting the U.S. Opinion among Clinton supporters is reversed (51% not gone far enough, 35% too far).